Put simply, your brakes are your life, so it pays to choose reputable components when uprating a brake system. With a long history and numerous achievements it all forms of motorsport there cannot be many names more reputable than Cosworth. 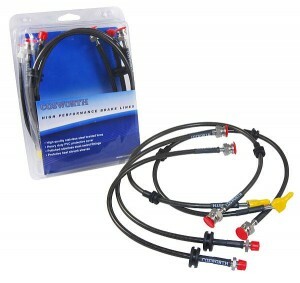 The company has now produced their own brand of stainless steel brake lines. They are finished in a protective black PVC cover and the end fittings are swaged together for durability and are protected with a heat-shrunk rubber cover, bearing the Cosworth logo as proof of pedigree. As you would expect of Cosworth all lines are thoroughly pressure-tested before released from the factory. Stainless steel brake lines have several benefits over stock rubber items and they will not swell like rubber hoses, they improve pedal feel, they are extremely reliable and can last a car’s lifetime. Available from Cosworth dealers worldwide or via 01604 598 300 or even www.cosworth.com. Print article This entry was posted by admin on February 28, 2013 at 6:12 pm, and is filed under News. Follow any responses to this post through RSS 2.0. Both comments and pings are currently closed.